Organizations are looking for solutions to securely store and charge devices while not in use. AVTEQ’s Tablet Charging Cart provides a reliable solution. AVTEQ, Inc., the largest manufacturer of AV carts and furniture, has announced it is now shipping the new Tablet Charging Cart, which can charge up to 48 devices. 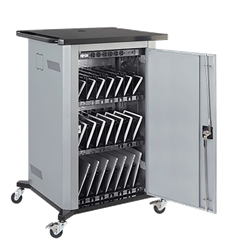 The Tablet Charging Cart offers steel construction and a three-point locking mechanism, making it a secure option for schools, hospitals, training centers and other facilities.